Did you know that when I was in my teens, I am totally obsessed with biking that up to now I got scars on my knees that will forever remind me of this sports? I wish I continued as an avid biker beginning college and up to now. I would have been a great biker! Anyway, enough of reminiscing good 'ol days. The reason why I opened this up because there is a big cycling event coming in a few days and I hope you guys check it out. 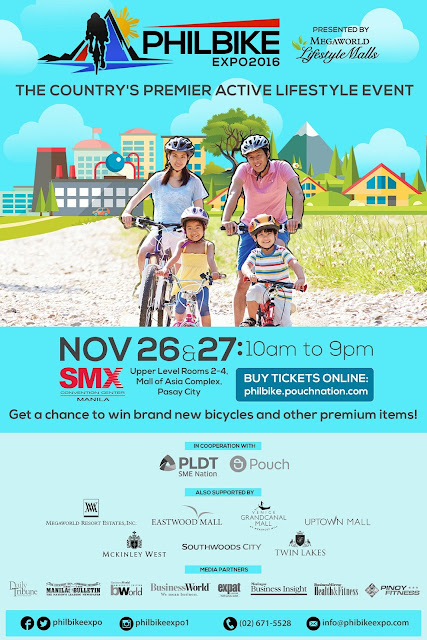 The PhilBike Expo, the only international-standard trade and consumer cycling show in the Philippines, returns for its third annual convention this November. The event kicks off on Nov. 25 and allows cycling enthusiasts’ access to the most diverse range of local and international products and demonstrations. Organized by Phil-Bike Convention Inc., the event has seen over 17,000 enthusiasts pack convention centers for two years. Regarded as one of the biggest names in the bike trail world scene, “The Magician” Kenny Belaey is a 24-year veteran of the sport. Since his debut in 1992, Belaey has brought the sport to the mainstream as a constant innovator and professional. He is the record holder of the most medals won at the World Cup and World Championships. His latest video project, “Balance”, saw him crossing a slackline on the top of the French Alps, a feat that had yet to be accomplished by any other biker before him. The Superkids are Japanese prodigies made up of Yu Shoji (14) and Takumi Isogai (15). This dynamic duo has been making a name in the Flatland scene with their cutting edge and flair for pushing innovation to its limits. Shoji is the first place winner of the 2015 Voodoo Jam and the second runner-up for the 2014 FlatArk Novice. Isogai was the first place winner of the 2014 FlatArk Expert and came in at eighth place for the 2016 FlatDev Pro. Accompanying the Superkids is their mentor, Viki Gómez, who is returning to PhilBike for the second year in a row. Hailed as one of the best in the world, the 35-year-old Spaniard is known for his constant creation of new tricks that combine flow and rhythm and surpassing the limits of imagination. The Red Bull athlete is a three-time Champion of the Flatland World Circuit Series, as well as a three-time Red Bull Circle of Balance Champion. He is also a two-time winner of the European X-Games. Rounding out this incredible line-up is a special, one-day only performance from Canadian, Geoff Gulevich. With a career that started at the age of 12, the Rocky Mountain Bicycle ambassador is among the best in his field, combining passion with a strong sense of perseverance that sets him apart from his peers. He is the fourth runner-up for Jumpship 2011, and came in fifth for both the Red Bull Rampage 2010 and the Crankworx Joyride 2011. The event will bring together over 100 brands from the world of cycling and fitness, giving enthusiasts and first-timers alike, the chance to check out the very best and latest that the industry has to offer. To complement these brands, the PhilBike Expo offers unique, indoor interactive features that will get the adrenaline flowing. To top it all off, the event will include a selection of fun games, contests, and raffles that will give attendees the chance to bring home brand new mountain bikes as well as a collection of other exciting prizes. To purchase tickets, visit http://philbike.pounchnation.com/. Tickets are PHP120 for one day, and PHP200 for two days until November 21, 12:01PM only. Regular prices of PHP150 per day shall apply on site at the SMX Convention Center. Children ages 12 and below are entitled to a 50% discount while toddlers 3ft. and below enter for free. The PhilBike Expo is the country’s first and largest trade and consumer show dedicated to the promotion and development of cycling and related industries. Organized and produced by Phil-Bike Convention, Inc. (PBCI), PhilBike is now on its 3rd year of bringing together different cycling categories under one fun and interactive event. For more information on PhilBike Expo, follow along on Facebook, Twitter, and Instagram: facebook.com/philbikeexpo, twitter.com/philbikeexpo and instagram.com/philbikeexpo1.